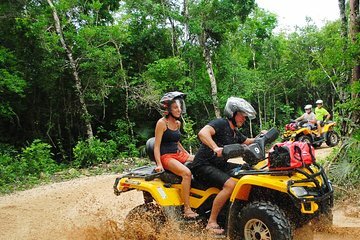 Explore the Yucatan jungle by ATV, zipline, and underground river on a full-day adventure tour from Cancun. You’ll steer your own ATV through the forest, take on a series of ziplines, then jump into a cenote to snorkel a freshwater river through a limestone cavern. This full-day adventure tour includes all activities, a buffet lunch of Mexican cuisine, and round-trip transport from your hotel in Cancun. Optional collision insurance avaiable for $15USD. Get an early start on the day with 7am pickup at your hotel in Cancun, then travel to a jumping-off point in the Yucatan jungle. Hop on a two-passenger ATV after a short briefing on technique and safety, then rev the engine while driving on forest trails. Next you’ll get high above the trees, soaring through a zipline course that overlooks the jungle canopy (this is the perfect way to spot some of the Yucatan’s colorful birds). Follow your guide to an opening in the jungle floor that leads to a cenote, a sinkhole into one of the area’s limestone caverns and underground rivers. If you’d like to see beneath the surface of the fresh water, snorkeling equipment is provided. The final stop of the day is a local restaurant, where you can refuel from your adventures with a buffet lunch of grilled chicken, rice, beans, salad, chips, and salsas, as well as a non-alcoholic drink. This full-day tour concludes with return transfer to your hotel in Cancun. Note: Bring along comfortable clothes and footwear, water shoes, sunglasses and hat, bathing suit, extra T-shirt, towel, only biodegradable sunscreen and mosquito repellent, cash (pictures, souvenirs, tips and extra insurance). Brilliant from start to finish! Starting off with driving an ATV to going to an amazing outside Cenote, the buffett lunch was yummy but limited for vegetarians as we saw with someone from our tour! You also do excellent zip wiring and swimming in an underground cave cenote! A trip 2 go for sure!